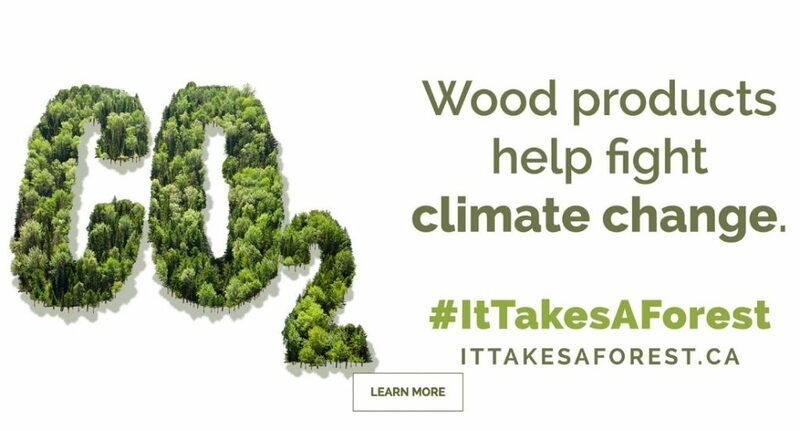 March 30, 2017 - It Takes a Forest to build communities and a healthy economy, It Takes a Forest to combat climate change and It Takes a Forest to keep us healthy, that’s why Forests Ontario initiated the #ItTakesAForest (ITAF) campaign, a proactive approach to sharing the story of Ontario’s forests. ITAF is a collaborative led by Forests Ontario in partnership with individuals and organizations across Ontario. Our common goal is to provide unbiased, fact-based information to improve the public’s awareness and understanding of Ontario’s forest sector. It is important that we work together to improve the understanding that forests are the province’s most sustainable resources. Ontario’s forest management standards ensure that we have access to high quality, locally sourced wood products and sequester carbon, while maintaining economic potential, human well-being and protecting ecosystems. Forestry professionals in the province understand that forests are the backbone of a thriving society. As a renewable resource, forests don’t just supply clean air and water, wildlife habitat, and recreational opportunities; they also provide the materials needed to create products that we rely and benefit from every day. The challenge, and one that is at the core of the ITAF campaign, is to share this with the broader public. We are looking to counteract the misinformation about the forestry sector. By telling our story we can connect the public, including those in rural and urban areas, to the families, companies and products that are making significant contributions to our economy, and our overall health and well-being. Numerous national and international studies also recognize that Ontario has some of the best managed forests in the world. It is only fitting that we continue to work to ensure our forests are managed responsibly to provide sustainable benefits for generations to come. In less than a year we’ve launched a website (ittakesaforest.ca), compiled resources and info­rmation on forest management and use this information to present to groups across the province, including municipalities, professional associations and not-for-profits. To date we have more than 40 supporters across Canada. But the work does not stop there; the campaign has a significant social media following which provides a great platform to share the story. There is no better time than now, in the face of climate change, government and the general public have their eyes and ears on the developing carbon programs across the country. At the core of that understanding is the general concept that sustainably managed forests contribute to mitigating climate change (International Panel on Climate Change 2007). Forests have a significant role to play; whether it is managing our forests to maximize carbon sequestration, ensuring the right species is planted on the right site, or ensuring we are creating products that will hold carbon for centuries. This is yet another example of a great opportunity for the forest sector to start telling the story, now is our time to talk. As we continue our efforts to engage the public, we need to continue to recognize that those outside the sector in our urban centres represent business leaders, policy makers, and the majority of our voting population. Each of these areas presents opportunities to influence the future of our forests and forest management. We’ve build-up a great deal of momentum so far and we will continue moving forward by strengthening the voice we’ve created. As members of the forest sector, we encourage you to add your voice to this collaborative effort. To find out more about how you can become a supporter of this campaign, please visit ittakesaforest.ca. Your support enhances our capacity to deliver initiatives like those discussed above and create informed and inclusive discussions around the role of our forests in shaping healthy and vibrant communities. Rob Keen, R.P.F., is the chief executive officer of Forests Ontario. What goes into a $13M sawmill investment?